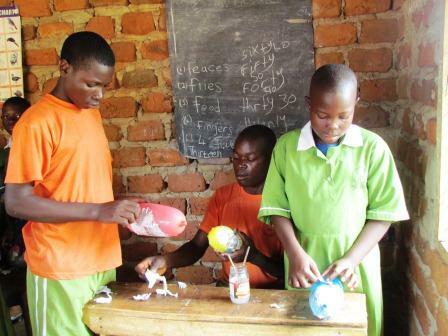 In Uganda local communities view children with disabilities as useless and meaningless. Parents of children with disabilities are less motivated to educate them, as most think it is a waste of time and resources. Spring of Hope has encouraged parents to take their child to school. SoHUG has used donated money to pay for school fees, health assistance, and daily life support. Kids looking for sponsors. . . The cost of sponsoring a child with a disability to attend school is £250 per year and this can be paid monthly, quarterly or annually to suit one's needs. You can sponsor a child by through givengain or if you are UK tax payer order through Stewardship (payable to Spring of Hope user number 20041306). Both charities allow you to receive a tax break. Spring of Hope has a "named account" with Stewardship who then transfer the funds into our account. We will send you the relevant form and a child will be matched to you. The SOH team will arrange for the child to commence school and send a photograph and details of the child. A school report and letter or picture from the child is sent out about three times a year so you can develop some links with the child. In the beginning we knew that we our aim was to see how children with disabilities could be accepted as part of the community and see that they were part of everyday life in their families. We started to look at the area of education and noticed that the schools did not know enough about working with children with disabilities . We then started working alongside the schools to promote inclusion. We realised that many children were unable to gain an education due to communication issues; the start of Sign Language training took off. Both Kisega and Mount Zion teachers have undertaken a basic certificate in Sign Language. During the holidays, our education worker visits the children at home to assist the parents on Sign Language studies and assists them to communicate with their child. We work alongside different schools who have children with disabilities in them, so that they can know how to work with these children to enable them to reach their true potential. We believe that if we train teachers and schools on how to work with the children, we will be able to empower them for the future and for the future children who may attend the school. Currently Kisega school has 22 children with disabilities and Mount Zion has 40 children with disabilities. To SoHUG this shows that we are achieving our goal by seeing the door for children with disabilities open to receive an education.